They brought him who formerly was blind to the Pharisees. Now it was a Sabbath when Jesus made the clay and opened his eyes. Then the Pharisees also asked him again how he had received his sight. He said to them, “He put clay on my eyes, and I washed, and I see.” Therefore some of the Pharisees said, “This Man is not from God, because He does not keep the Sabbath.” Others said, “How can a man who is a sinner do such signs?” And there was a division among them. They said to the blind man again, “What do you say about Him because He opened your eyes?” He said, “He is a prophet.” But the Jews did not believe concerning him, that he had been blind and received his sight, until they called the parents of him who had received his sight. And they asked them, saying, “Is this your son, who you say was born blind? How then does he now see?” His parent answered them and said, “We know that this is our son, and that he was born blind; but by what means he now sees we do not know, or who opened his eyes we do not know. He is of age; ask him. He will speak for himself.” His parents said these things because they feared the Jews, for the Jews had agreed already that if anyone confessed that He was Christ, he would be put out of the synagogue. Therefore his parents said, “He is of age; ask him.” So they again called the man who was blind, and said to him, “Give God the glory! We know that this Man is a sinner.” He answered and said, “Whether He is a sinner or not I do not know. One thing I know: that though I was blind, now I see.” Then they said to him again, “What did He do to you? How did He open your eyes?” He answered them, “I told you already, and you did not listen. Why do you want to hear it again? Do you also want to become His disciples?” Then they reviled him and said, “You are His disciple, but we are Moses’ disciples. We know that God spoke to Moses; as for this fellow, we do not know where He is from.” The man answered and said to them, “Why, this is a marvelous thing, that you do not know where He is from, yet He has opened my eyes! Now we know that God does not hear sinners; but if anyone is a worshipper of God and does His will He hears him. Since the world began it has been unheard of that anyone opened the eyes of one who was born blind. If this Man were not from God, He could do nothing.” They answered and said to him, “You were completely born in sins, and are you teaching us?” And they cast him out. Jesus heard that they had cast him out; and when He had found him, He said to him, “Do you believe in the Son of God?” He answered and said, “Who is He, Lord, that I may believe in Him?” And Jesus said to him, “You have both seen Him and it is He who is talking with you.” Then he said, “Lord, I believe!” And he worshipped Him. 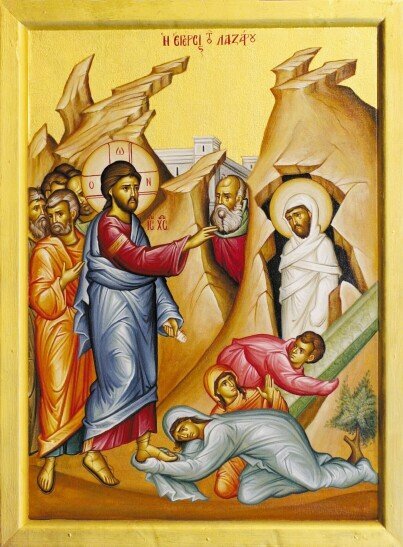 As with all of His miracles, there is great significance to Jesus Christ healing the blind man. It is the only time we hear of a person whose sight was received after having been blind from birth. In those days, there was a pervasive belief that sickness was a direct result of sin. Therefore, the Lord is questioned whether the sin of the man or his parents is the root cause of his blindness. And while humanity’s sin, the primordial sin, is the reason for all sickness, suffering, and death, Jesus Christ discredits the notion that it was the personal sin of either this man or his parents that led to his impairment. Rather, the man’s lack of sight will serve a greater purpose—to glorify God. Although few of us need to be healed of physical blindness, all of us need to be cured of our spiritual blindness—the sin that keeps us from living a life in Christ. What is happening in this Gospel lesson? Why do the Pharisees react negatively to such a miracle? How does the man who was granted sight respond to the Pharisees’ questions? Why can’t the Pharisees accept the blind man’s explanation of who Jesus is? What does this Gospel lesson mean to our lives? Blindfold, Please—Take turns blindfolding different members of your family and having another family member guide them around. After everyone has had a turn, discuss what it was like not being able to see. Discuss how we can be spiritually blind and how we can work to see properly as Orthodox Christians. Witness—The once-blind man, having received his sight, responds to Jesus Christ’s critics with great conviction. Discuss as a family how to defend your Orthodox Christianity in a world that increasingly grows hostile and indifferent to religious beliefs. Support—As we learn in today’s Gospel there are often many misconceptions regarding people with disabilities. When questioned by the disciples as to whose sin caused this man to be born blind, Jesus states, “Neither this man nor his parents sinned, but that the works of God should be revealed in him.” How can the works of God be revealed through our weaknesses? As you discuss this, visit Arms Open Wide: Orthodox Christian Disability Resources Web site (http://armsopenwide.wordpress.com/). This online resource was developed to support those with disabilities in the Orthodox Church. We can shed much light on our blindness to the special needs of those around us by reviewing some of its resources. If we are to see again, a miracle must take place. Jesus must touch our eyes as He touched the eyes of the man born blind. Then we will begin to see. Then we will come to realize that without Jesus no man can truly see and with Him no man can be truly blind. He is the opener of the eyes of the soul, and without Him it is always darkness. The Body of Christ by Fr. John Chryssavigis—This book is an excellent guide to address ministry to the disabled. As members of the Body of Christ we are all called to care for one another and offer a critical witness as we proclaim the kingdom of God. Published by Light and Life Publishing. Icon Coloring Book: The Miracles by Fr. Joseph Kimmett—Your little ones can color icons of all the miracles of Christ. Published by Annunciation Press.